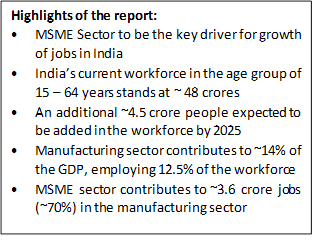 Nomura Research Institute Ltd. (NRI Consulting & Solutions), after a deep dive in to a study on the employment opportunity indices in India, has come up with a projection that India’s MSME (Micro, Small and Medium Enterprises) sector is poised to create ~1 crore jobs in next 4-5 years. The report states that growth of middle class & rising disposable income positions India as an attractive market for consumption. However, a substantial portion of what is consumed in India is catered to by imports, thereby limiting the domestic manufacturing sector’s ability to create employment opportunities. While there have been efforts to boost domestic manufacturing, a dedicated focus on manufacturing MSMEs spread across various clusters can lead to creation of these many jobs, through measures aimed at improving the market competitiveness of MSMEs. NRI Consulting & Solutions is one of the largest consulting firms in Japan with a very strong footprint in Asia. Creating and Innovating the future is part of NRI’s DNA. At the NRI Group it is believed value creation involves unearthing issues facing clients and markets and then helping clients solve these issues. NRI has ~700 consultants globally and a strong team in India of 120+consultants focused on Strategy & Business Performance Improvement (BPI) Projects.